Hunting on the central coast of California offers many varied species of game. Among those offered by Anderson Taxidermy & Guide Service, Inc. are free ranging Aoudad Sheep also known as Barbary Sheep which originated in north Africa. Another non indigenous species in the local region are Sambar Deer which originated in India and are offered exclusively by Don as a free ranging hunt on some of the most scenic coastal range California has to offer. 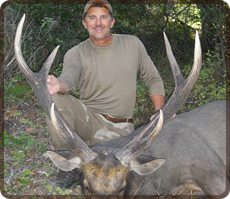 This hunt is limited to very few hunters and books quickly due to the very rare opportunity to hunt Sambar Deer in California. It truly is a hunt of a lifetime. Other hunts also available on the central coast include California Blacktail Deer, Spring and Fall Rio Grande Turkey, Tule Elk, Varmint and Wild Pig. In addition to the above, Don also is licensed and permitted to guide for Desert Bighorn Sheep in California. If you are among the few lucky enough to draw a California Desert Bighorn Sheep tag, an opportunity of a lifetime, consideration to avail the services offered in having a knowledgeable guide is key to a successful outcome. 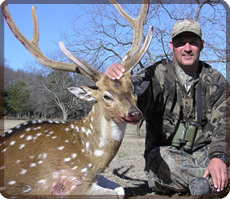 Anyone who has hunted with Don can and will be happy to refer his services in his ability in judging a trophy animal and placing his hunter's goal first to provide a quality hunting experience. The Aoudad also known as Barbary sheep have been free ranging since the early 1930's. Since that time they have populated certain private properties along the central coastal range of California. With a game management program and limited hunting pressure, we have been able to maintain the herd's population to 200-250 sheep. We have been guiding hunts on the central coast on private lands for over 20 years. Anderson Taxidermy & Guide Service, Inc., provides exclusive hunting on two separate ranches. This is a two (2) day hunt with transportation and lunch provided. Extra days may be added on to this hunt at an additional daily fee rate. This has seldom happened or been necessary. In previous hunts, most sheep have been taken in the first two days. 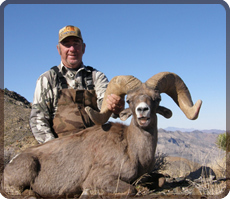 Trophy size of the Aoudad, in this hunting area, will range in size from 27"� to 30"�, while body weight averages between 200 lbs. to 250 lbs. This population is the only free ranging herd of Aoudad sheep within the state of California. The best time to hunt Aoudad on the central coast range of California is from the middle of October thru November, the breeding season for Aoudad. This is also the best time of year in which to hunt Aoudad because of the hair quality which is longer during these months. During this time of year larger numbers ranging between 100 to 200 Aoudad can be seen in a single group. The area on which we hunt is located approximately 6 miles from the Pacific Ocean and the views are spectacular. Lodging is not provided on this hunt but there are many local motels in the area. The area we hunt is a lead free hunt zone in California. The use of copper bullets or lead free bullets are mandatory. For additional information specific to this hunt or others, please contact us directly. Thank you. Hunting season begins the second Saturday in August and continues thru the second to last Sunday in September. All hunts are conducted on private property. This ensures a good game management policy. All hunts are for a three (3) day period. Extra days may be added on to this hunt at an additional daily fee rate. Services provided are transportation in the field, lunch, and field care of your trophy. Lodging is not provided but many motels are located near the hunting area. We have limited openings for deer each year. This hunt is in Zone A. The area we hunt is a lead free hunt zone in California. The use of copper bullets or lead free bullets are mandatory. The average deer taken on this hunt should have an 18" spread and at least 3 points on one side. If you draw a deer tag for Goodale G-3 Deer Hunt, G-39 Round Valley Deer Hunt, J-12 Round Valley, or X9C Deer Hunt, I am experienced and licensed in these areas and could guide you on these special hunts. I have been a licensed guide in California for over 30 years. During that time, I have guided all four species of North American sheep. I have guided Dall Sheep in Alaska, Stone Sheep in British Columbia, Canada, Rocky Mountain Big Horn Sheep in Montana, and Desert Bighorn Sheep in California. After drawing a sheep tag myself in California, I decided to offer my services to guide other hunters for sheep in California. In this way, I can assist other hunters achieving their goal with the experience and knowledge I can provide so they may have their own experience on a once in a lifetime hunt, as I did. I am licensed and have all permits to guide in all Desert Sheep Hunt Zones in California. Services will be limited since I will only be booking two or three hunters per season. The purpose is to provide a hunt which will focus on quality instead of quantity. This is your hunt of a lifetime. I will not push you into shooting any ram to end your hunt early in order to move on to another hunter. I will hunt as hard as I can to assist any hunter in finding the best ram as we can in the hunt area. Once a ram is found, I will tell you what the sheep should potentially score. It will be your decision to go for the sheep or not. This is your hunt, not mine. Every effort will be put forth in assisting you in finding the sheep of your choosing. So if you need the assistance of an Desert Bighorn Sheep Outfitter and Guide in California Sheep hunt Zones, Zone 1 Marble/Clipper Mountains, Zone3 Clark/Kingston Mountain Ranges, Zone 4 Orocopia Mountains, Zone5 San Gorgonio Wilderness, Zone 6 Sheep Hole Mountains, Zone 7 White Mountains, Zone 8 South Bristol Mountains, or Zone 9 Cady Mountains please contact us for more information. If you are interested in having a Desert Bighorn Sheep Outfitter and Guide assist you on your once in a lifetime hunt please contact us. I offer three options to the types of hunts that I will conduct. 10 days of hunting and pre-scouting are provided in this hunt package. Round trip transportation can be provided from the nearest airport to the base camp. Lodging will be provided within a house trailer or wall tent depending on the location of the base camp with all meals provided. All field transportation, preliminary meat care and trophy preparation will be provided on the Fully Guided Hunt package. This hunt is structured for any person who only requires assistance in their hunt to seek out and judge the quality of animals in the field, in order to take the best ram presented during the hunt. Hunters opting for this package will be required to supply their own lodging and food. Anderson Taxidermy & Guide Service, Inc. will accompany the hunter for 10 days. This hunt is for a period of 5 days. Extra days may be added on to this hunt at an additional daily fee rate. Hunters will supply all food, lodging and fuel for transportation. A guide will accompany you at all times to spot, judge and assist you in taking your sheep. Free ranging guided Sambar Deer hunts are exclusively offered in California by Anderson Taxidermy & Guide Service, Inc. Should you be interested in hunting Sambar Deer, know that this is a rare animal and the opportunity to hunt them here on the central coast of California is equally so. The opportunity to access an area such as this, is one of the most exclusive opportunities you may ever have in a lifetime. The opportunity for hunting in California for Sambar Deer is being limited to four bulls a year. The hunts book quickly due to the limited numbers allowed, as well as the opportunity to hunt a free ranging Sambar Deer in the United States. Should you be interested in being one of the very few to have this rare opportunity to do so, then please contact us immediately to book your hunt. Due to the limited number of animals being taken off this property annually, the opportunity to offer the Sambar Deer hunt on such an exclusive property, individuals should consider booking this hunt a year in advance. The Hunt Package Includes: All hunts are 1 x 1 (guide to hunter ratio) unless otherwise requested. The hunt is a four (4) day hunt. 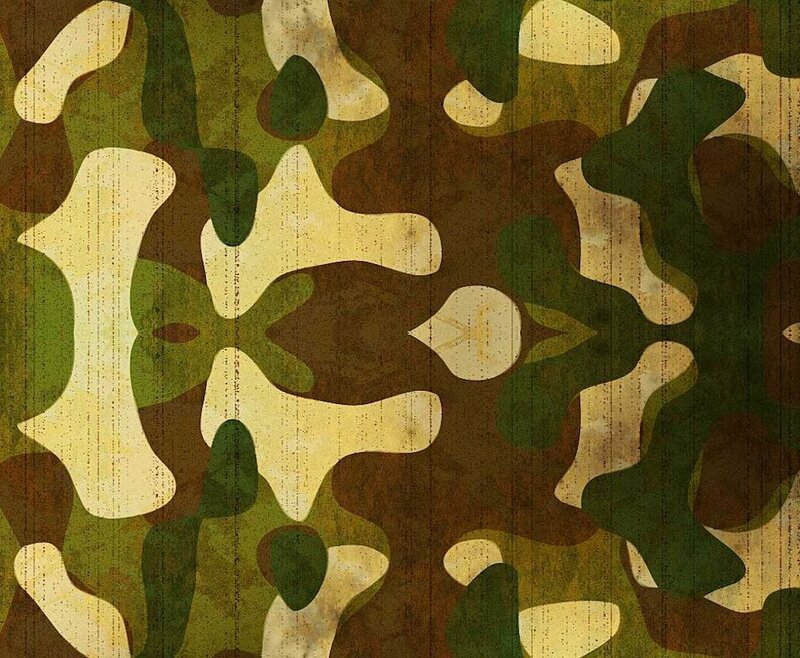 Off site accommodations and meals incurred by the hunter are not covered or included. A single non-hunting companion is allowed. It should be known there is an added Daily fee for the non-hunting companion. No more than two hunters and two non-hunting companions will be allowed on any one hunt, in the field with one guide at any one time. Filming of the hunt is for personal use only. No commercial use of footage will be allowed. The hunt is offered during California's posted deer season for Zone A. The open hunt dates will be provided at the time of booking. A valid California General Hunting License is required for any and all individuals wishing to hunt. No tag is required for the Sambar, however should a Wild Boar be combined to the hunt, a tag is required and will have to be acquired beforehand. PLEASE NOTE: California Department of Fish & Game has mandated this area (Zone A) be restricted to use of Copper bullets or lead free bullets only. No other bullets will be allowed for hunting in this area. Hunting Sambar Deer in California is exclusively provided by Anderson Taxidermy & Guide Service, Inc.
Read about Don Anderson in Safari Club on our Sambar Deer hunts. Should you be interested in hunting in California and having an opportunity to add to your trophy room wall one of these species, contact us soon to secure a date for your future hunt. Inquire about pricing! Anderson Taxidermy & Guide Service, Inc, provides both public land hunts in the LaPanza Period 1 and Period 2 hunt zones and all periods of the Grizzly Island hunts zones to hunters who successfully draw a tag for Tule Elk. For hunters who do not draw a tag, Private Lands Management tags can be acquired. For further information on “PLM” tags, please inquire. 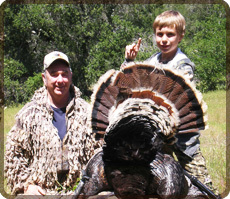 Anderson Taxidermy & Guide Service, Inc. provide turkey hunting on the Central Coast of California. The species of turkey hunted here are Rio Grande. Hunting takes place on exclusive and pristine ranch lands which has had limited hunting upon it over the last 40 years. Two different seasons are available in which to hunt turkey in California. Spring hunting is normally the last weekend of March running thru the first weekend of May. The Fall hunting season typically occurs in mid November. Check current regulations for specific dates. Spring hunts are popular in that you can call the birds in while Fall hunts are spot and stock. This is a two (2) day hunt with transportation and lunch provided. The hunt is for one (1) bird, while a second may be taken for an additional trophy fee. If time permits, varmint hunting is available at no extra charge. Lodging is not provided, however we can recommend local accommodations while we provide transportation directly from the motel into the field. This is a one on one hunt, however should two hunters wish to hunt together, it can be arranged. A non-hunter can accompany each hunter during the hunt at the additional cost of the daily rate fee per day. 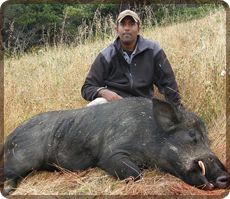 Note, at the present time we do not offer pig hunts unless they are in conjunction with a Sambar. Varmint hunts are available year round weather permitting. The animals to be taken on this hunt consist of coyote and ground squirrel. This is a one (1) day hunt, additional days can be added on at the basic daily rate. All transportation in the field will be in company vehicles only. The area we hunt is a lead free hunt zone in California and copper bullets are mandatory. Inquire about pricing. Thank you. Anderson Taxidermy & Guide Service, Inc. guides on a ranch 60 miles southwest of Dallas, Texas. The Kennedy ranch has 1,000 acres of high fence and 500 acres of open range. This ranch has a variety of exotic animals, whitetail deer and pig. It also has a number of lakes with a variety of fish. Hunters can be picked up at the Dallas-Fort Worth airport. Lodging consists of a three bedroom building on the property with shower, kitchen, washer and dryer. Hunters will supply their own food and can cook in the kitchen supplied; guide will help with cooking unless otherwise occupied with skinning and caping animals. There are numerous deer on the ranch both in high fenced areas as well as free ranging. Typical size of the deer seen and being taken are 120 to140 B&C. This is typical for this area of Texas. All exotic animals are contained in high fenced area except pigs. We have all types of exotics on the ranch. Please view our hunt photos to see the different variety of animals that are available. Our most typical exotic animals are Blackbuck, Fallow Deer, Sika Deer, Axis Deer, Mouflon Sheep, and Aoudad Sheep. 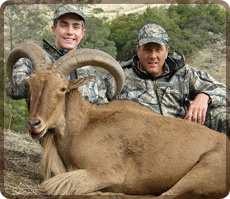 Our Aoudad Sheep are extremely large and range in size from 30"� to 34"�. Inquire about trophy and daily fees. I have been a licensed guide in Alaska for 30 years. During that time I have guided for Brown Bear, Black Bear, Dall Sheep, Caribou, Moose, Mountain Goat, Sitka Blacktail Deer, Wolf, and Wolverine. Over the years, I have become quite familiar with these animals habits, characteristics, and movements which has helped me in both guiding and in the taxidermy phase of my business. I have guided for both Don and Warren Johnson (Bear Lake Lodge) for 30 years. Their lodge and guide area is located on the Alaska Peninsula about 90 miles east of Cold Bay, Alaska. This is one of the best areas in Alaska for large Brown Bear. This is also one of the nicest lodges on the Alaska Peninsula. Bear Lake Lodge has been in business for over 55 years. Their record for large bears stands by itself. Seasons for bear hunts are (Fall Hunts) Oct. 1 to Oct. 21, on odd numbered years; (Spring Hunts) are May 10 to May 25th on even numbered years. Spring Hunts are either 8 days or 15 days in length. Fall Hunts are 10 days or 18 days in length. If you are interested in one of these hunts please contact me about booking a hunt. If booked by Anderson Taxidermy & Guide Service, Inc. I may be able to personally guide you on your hunt. If booked by Anderson Taxidermy & Guide Service, Inc. I may be able to personally guide you on one of these hunts. More often the pleasure in hunting is the time spent with friends enjoying the opportunity to share time and experiences together. 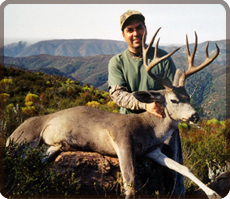 Hunting in Mexico is what came about when Tony and Peter Aivazian, who have hunted with Don for California Blacktail Deer, Aoudad Sheep, Mule Deer and Roosevelt Elk in various locations on the central coast of California, started looking for a Coues Deer hunt in Mexico. Tony, Peter and Don took their first trip hunting Coues Deer in 2002. 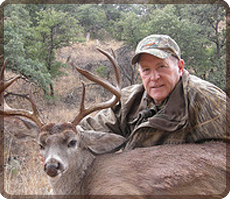 Since then, Don has guided Coues Deer hunts and has taken many hunters to enjoy this camp and hunt for Coues Deer in Sonora, Mexico. Pictures displayed here will show you the quality of deer provided on this particular hunting experience and in viewing taxidermy mounts you may recognize them from the photos provided here of many satisfied hunters. Camps are usually held to 4 hunters and 4 guides and only 4 camps per year. This avails some pretty exclusive hunting of large properties which are carefully managed to provide a sustainable herd of quality Trophy Coues Deer a discerning trophy hunter would seek. If you care to have an opportunity to hunt for Trophy quality Coues Deer in Mexico, this is a wonderful place to do so. 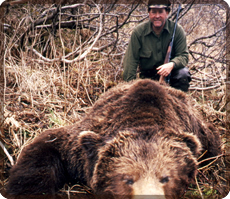 Hunting is provided on private ranches managed by one outfitter from here in the United States. All hunters meet in Tucson and travel in private vehicles into Mexico. From the time you leave Tucson until the time of arriving to the ranch house where you will reside for the duration of your hunt. This travel time provides ample opportunity to discuss details of the hunt with your guide, make a quick stop for any amenities before crossing the border and arrival to the ranch. Guide to hunter ratio is 1x1. This is a 7 day package, with the first and last days being travel days and 5 full days of hunting in between. All cooking is provided by staff. Breakfast, a packed lunch and Dinner upon returning at the end of the day are provided. For other details about this hunt package, please contact us. Once you have experienced this wonderful place and opportunity to hunt for Coues deer, you too may find yourself returning year after year not just for the challenge of taking a Coues Deer or Javalina, but to spend some time with your friends enjoying each other's company making memories and sharing the experience while also making new friends in Mexico. For the past number of years, I have been assisting an outfitter in Sonora, Mexico in guiding his Coues Deer camps. The hunting season for these deer, the smallest of the whitetail species is operated through the month of January. This hunt takes place in northern Sonora Mexico. Rancho Bonito is located about sixty miles south of the U.S. border. This ranch consists of 70,000 plus acres and has limited hunting on it. I have helped in guiding for the last eight years. The quality of deer on this ranch is excellent with a chance of getting a record book deer, the average deer taken is over 100 B & C.
Javelina are also available to hunt on this ranch. Hunts consist of seven days, of these five days of hunting and two days of travel. All hunters would meet in Tucson Arizona. and travel in guide's vehicles to the ranch and return on the seventh day back to Tucson Arizona. All licenses and gun permits are included in the price of the hunt. A second deer or javelina can be taken at an addition trophy fee. Lodging will consist of a ranch house and food will be typical of the area. Inquire about pricing and trophy fees.